A deposit is required of £50 low season and £100 high season with full payment required 6 weeks prior to arrival. 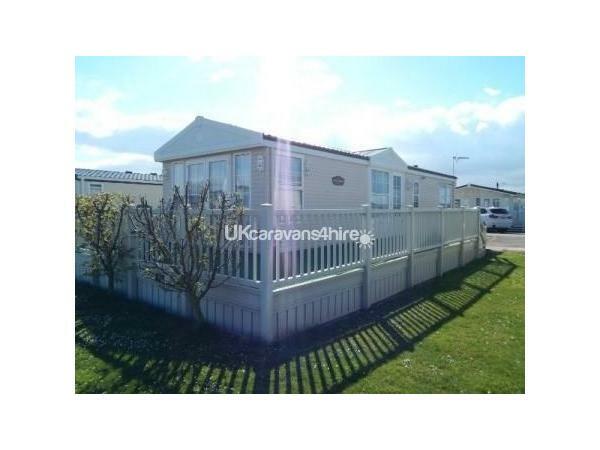 Welcome to our luxurious, privately owned 2 bedroom caravan situated on Manor Park Holiday Park in Hunstanton, Norfolk PE36 5AZ. 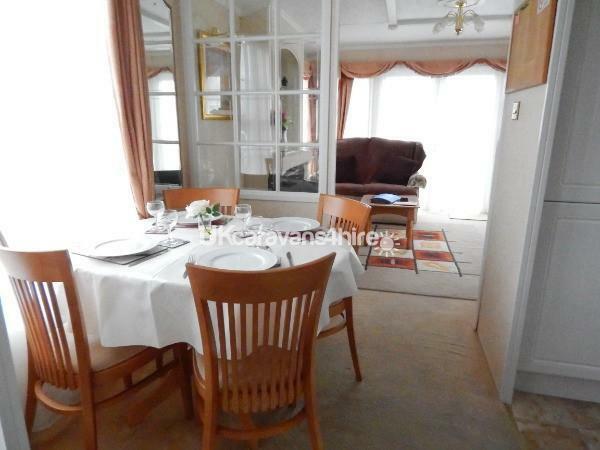 With double glazing/full central heating. Spacious decking area. Hard standing parking for two cars This is in the upgraded Kensington area of the park overlooking three lovely ponds. You can walk to the clubhouse or indoor swimming pool (new May 2016). It is also within walking distance of the sandy beach or into the town. Wifi is now available with pay as you go through Wifinity. LIVING ROOM: Spacious with widescreen TV and freeview. 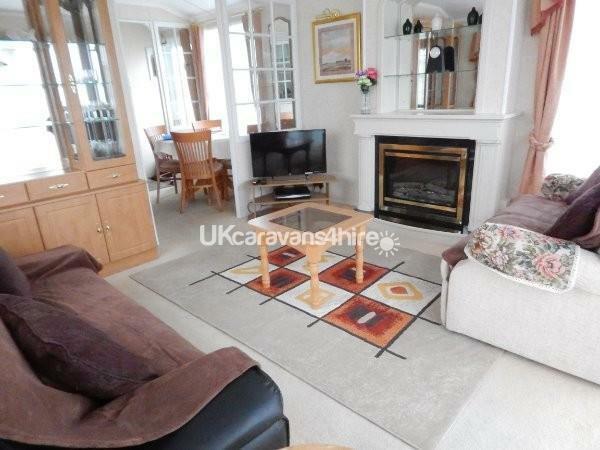 Full central heating, electric fire and double glazing throughout. Includes two seater sofa and three seater sofabed. Cane chair with cushion. Patio doors leading onto decking area. DINING AREA: Table and chairs with window to side. Fully equipped with plates, cutlery, glasses etc. Entrance door to side and storage cupboard with vacuum cleaner. 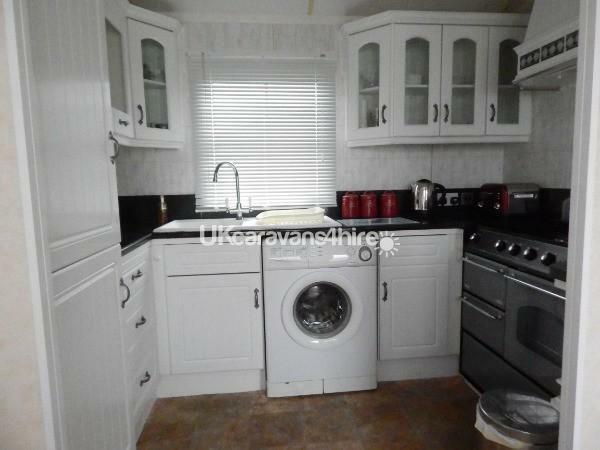 KITCHEN: Fabulous kitchen area with full length fridge/freezer, microwave, washing machine, oven with extractor fan, toaster and kettle. Pots and pans supplied together with all utensils. DECKING AREA: Relax and unwind on the spacious decking area, guarantees sunshine all day. Includes patio set, parasol and six chairs. 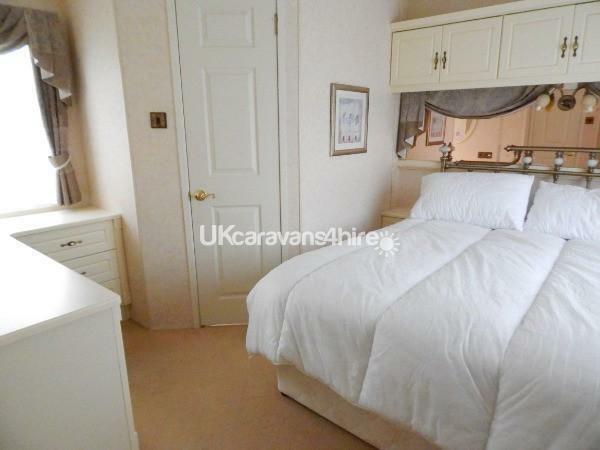 MAIN BEDROOM/EN SUITE: Comfortable king size bed with ample storage space, wardrobes and dressing table. Duvets and pillows supplied but please bring your own sheets and king size quilt cover. 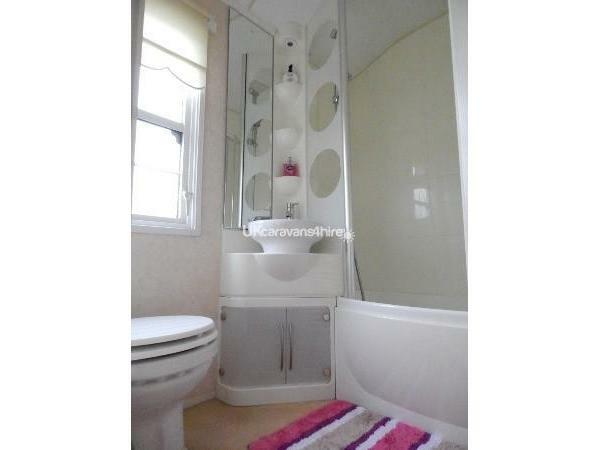 With en suite bathroom which includes bath/shower, hand basin and WC. BEDROOM 2: Two single beds with wardrobe and dressing table with drawers. Single duvets and pillow supplied but please bring your own single sheets and duvet covers. BATHROOM 2: Contains a shower, sink and WC. Great as a second bathroom. WE WELCOME ANY QUESTIONS SO PLEASE DO NOT HESITATE TO ASK. Thank you for looking and we hope to welcome you soon. 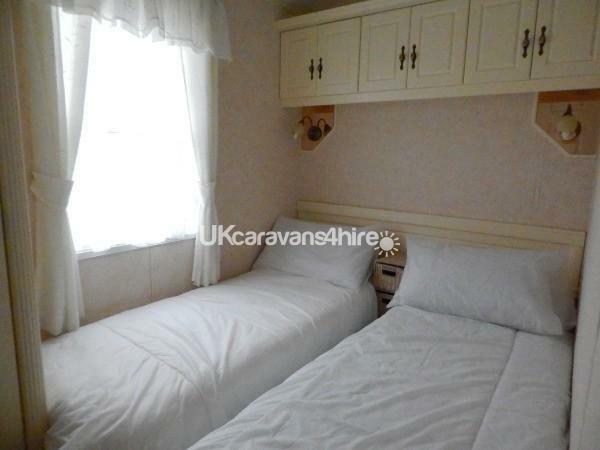 I was inspired to book this Caravan by the excellent reviews, facilities & photographs. Upon arrival we were met by Pauline the owner at the entrance to this lovely caravan park. We followed her to our home for the week & were pleased to find Pauline's caravan was way beyond our expectations. It was clean, comfy & inviting. Despite the time of year, we were cosy & warm thanks to the efficient central heating & double glazing. Everything worked as it should in this home, no worn out appliances. The King size bed was so comfortable, obviously a quality mattress. Pauline was kind enough to return on our first evening, to show us how to use the TV. It was our fault, had we read the simple instructions that were to hand, we could have saved Pauline coming out. We enjoyed a lovely comfortable week. Pauline was a pleasure to deal with, all being well, we hope to return next year. Had a wonderful fortnights stay in a lovely caravan . 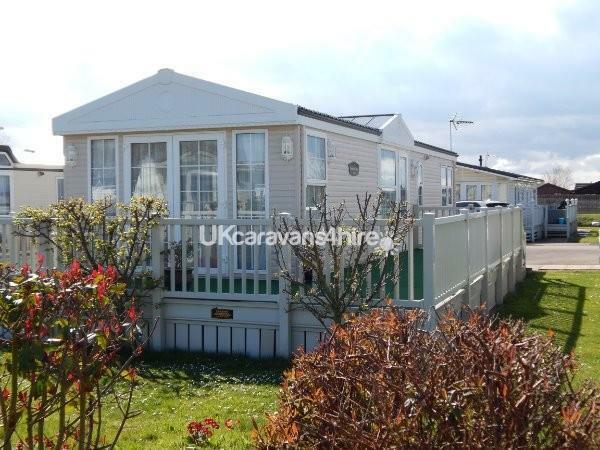 The caravan was well equipped and the positioning of it on the Kensington part of the park was perfect. The three ponds in the vicinity of the caravan with the company of the ducks was a delight. Pauline is a lovely lady who welcomed us at the gate of the park and showed us all we needed to know about the caravan and the little extras like tea and coffee and more were a lovely touch.Thank you for a wonderful fortnights holiday Pauline and hope to see you again in the near future. Regards Rob and Brenda. 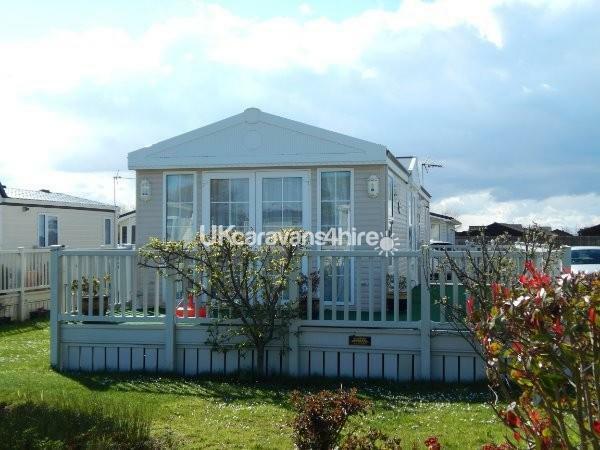 Pauline and Paul are wonderful friendly people, Their wonderful caravan is more of a holiday home than a caravan, situated in a wonderful peaceful location on the park, with regular visits from the resident ducks, what more could we ask for. Thank you so much and we will be back!! 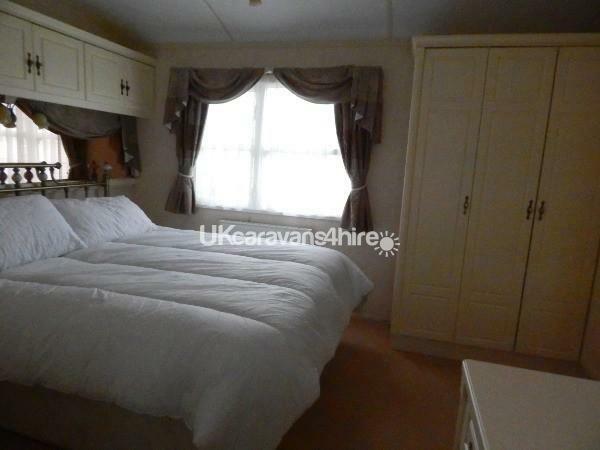 An amazing clean, spacious and homely caravan in a great part of the park. Overlooking the small pond was lovely and the children enjoyed feeding the ducks. Pauline is a lovely lady and left us a hamper which was greatly appreciated. Would highly recommend and will definitely be booking again. 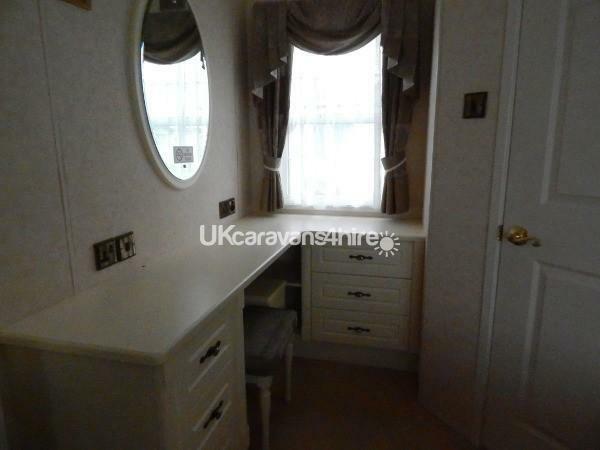 Lovely caravan, very well equipped. Had a fantastic weeks stay. Decking area overlooking ponds a bonus. Pauline and her daughter were a pleasure to deal with. I cannot recommend them enough. Situated on a quite exclusive part of the site. Small clubhouse but entertainment staff worked tirelessly to entertain, especially for the kids. Didn't try the food on site but there are plenty of options nearby.